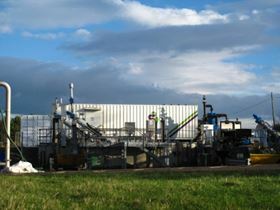 Scottish Water has teamed up with Applied CleanTech (ACT) to test the US firm’s SRS system at Dunbar and Aviemore Waste Water Treatment Works, the first time it has been installed in the UK. "In a nutshell, ACT's SRS technology is a very fine filter that captures all the cellulose and some of the fats, oils and grease coming into the waste water treatment works," said George Ponton, head of innovation at Scottish Water. "The solids are then pasteurised producing a pellet material called Recyllose. These pellets could then be used as a raw material in paper, plastic, construction, energy and other industries." Mr Ponton believes operating costs can be reduced by 30 % while the plant’s carbon footprint is also cut substantially. The SRS has been successfully used internationally in Mexico, Canada, Israel and the Netherlands. Now CleanTech is looking for UK investors to develop the market and has launched a crowdfunding campaign.